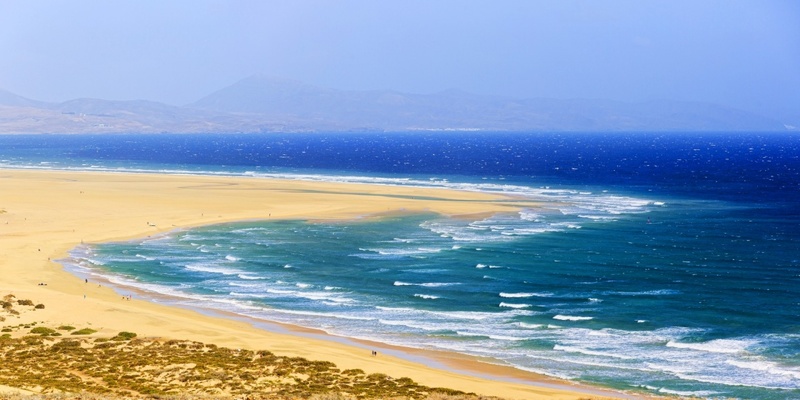 Fuerteventura has many beaches on its coast and they are widely varied. 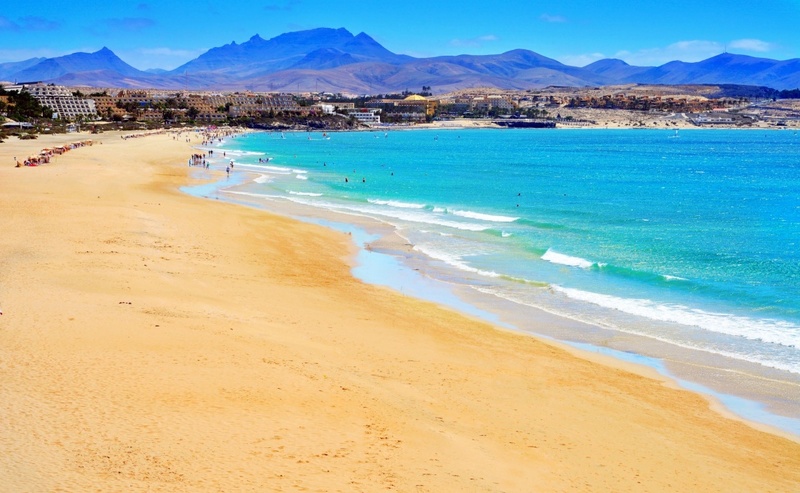 From white sand to black, rocky sand and even lagoon style, Fuerteventura has over 125 miles of beach and has something for everyone. 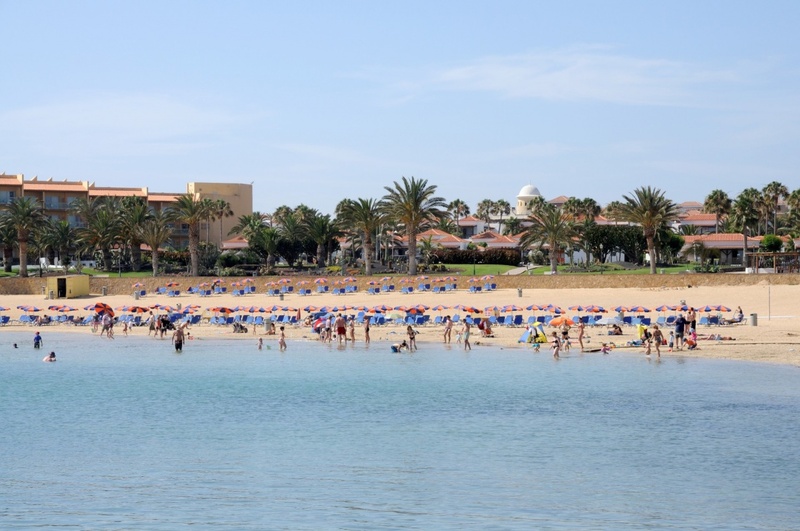 Corralejo, in the north, has multiple beaches and they are considered some of the best. There are many stretches of beach near the center and a few that are a kilometer or more from the center of town. 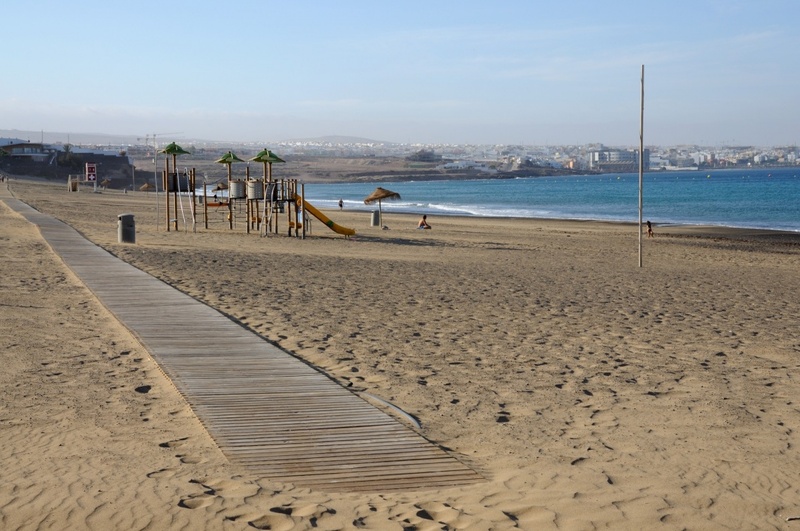 The large beaches in Corralejo have a wide area that they cover and many travelers fall in love with the golden sand and waves that are very fun to play in. Playas Grandes de Correlejo support a large part of the travelers coming to the island and have surely been in thousands of perfect vacation photos. The sand is bright white and very fine. Covering the majority of the northern-east tip of the island this area is the perfect location for kite surfing and para-sailing. 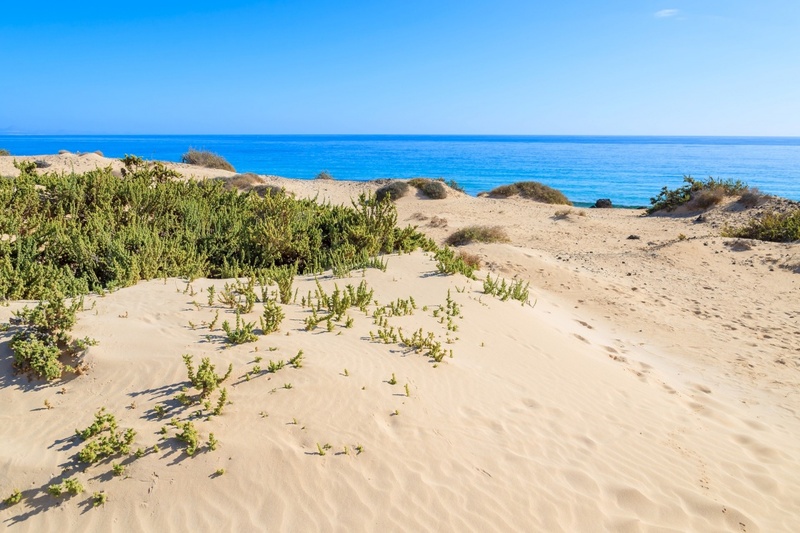 Five kilometers from Corralejo there is the Natural Park, where large sand dunes come almost all the way to the waters edge and they are a great place to have a hike and then a cooling dip. A spectacular landscape of 2,600 hectares where the white sand leads to turquoise waters. 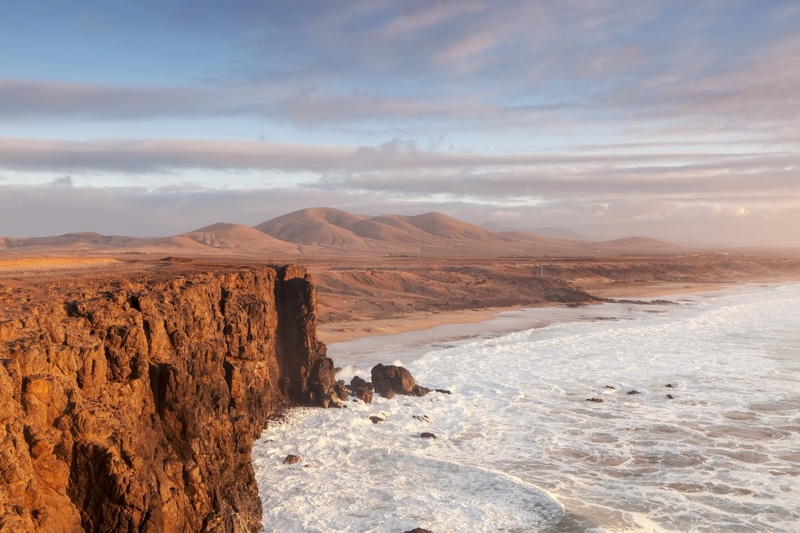 Further down the west coast not far from Corralejo you can find El Cotillo. 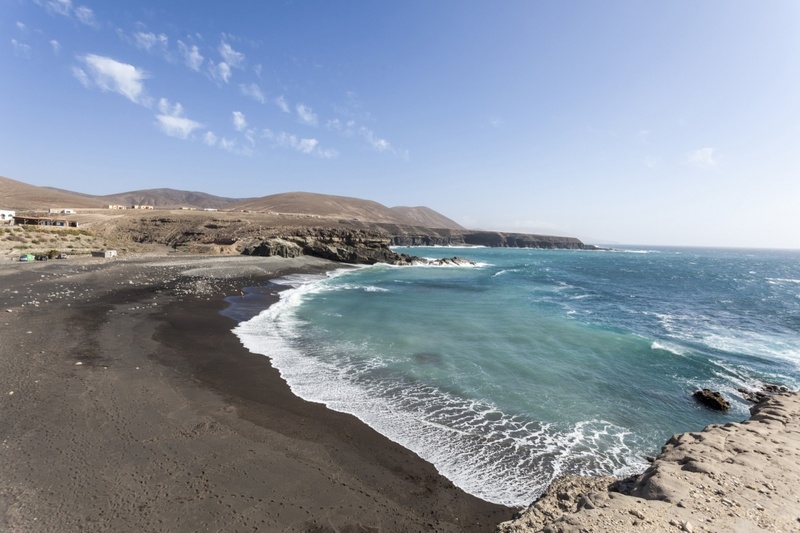 El Cotillo and its area has many lagoon-style beaches with mini harbors for snorkeling and swimming or just beach-combing. These calm lagoons, away from the waves, have many different spots to drop anchor and just chill. The west side of Fuerteventura is infamous for having a very strong under-toe or current that can challenge even the best swimmers out there. El Cotillo is the exception to this rule. Nevertheless, some of these beaches have sandy bottom and abundant waves that makes them ideal for practicing the sport of surf. Opposite to the untouched beaches near the cliffs, we find peaceful lagoons perfect for children. Playa Chica is an in-town beach, in the center of the island. 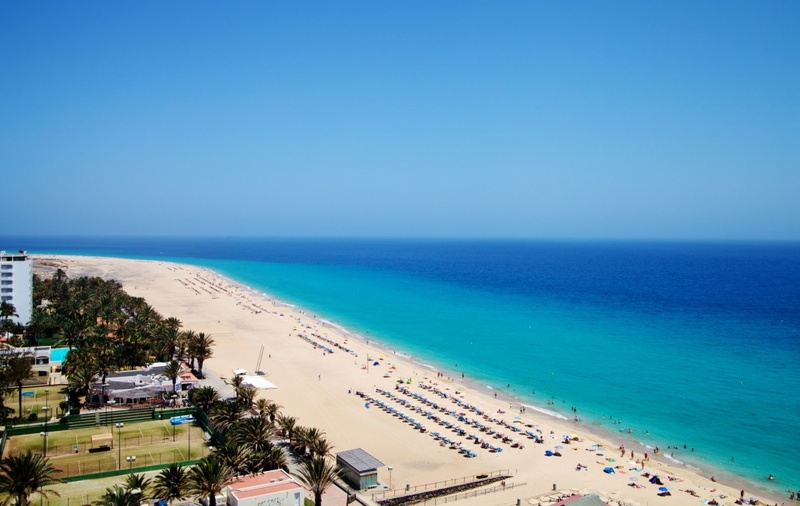 It´s visited by many locals and turists and has a large break water due to the port nearby so it´s great for families with babies and children. The waters are ultra clear and the sand is soft with very few waves. Traveling south you will come to Playa Blanca. Playa Blanca is the closest beach to the airport and should be enjoyed by all travelers. You can sit and watch the planes come and go while the surf school pupils crash again and again in to the surf. There are lifeguards here and flagpoles that tell if the surf is reasonable (Green flag)or a bit challenging (yellow flag) or should not be attempted (red flag). When there is a red flag you are only allowed to go a specific distance from the shore, usually only 15 meters or less. The shape of the ocean floor here creates a small riptide or undertow and should also be considered. 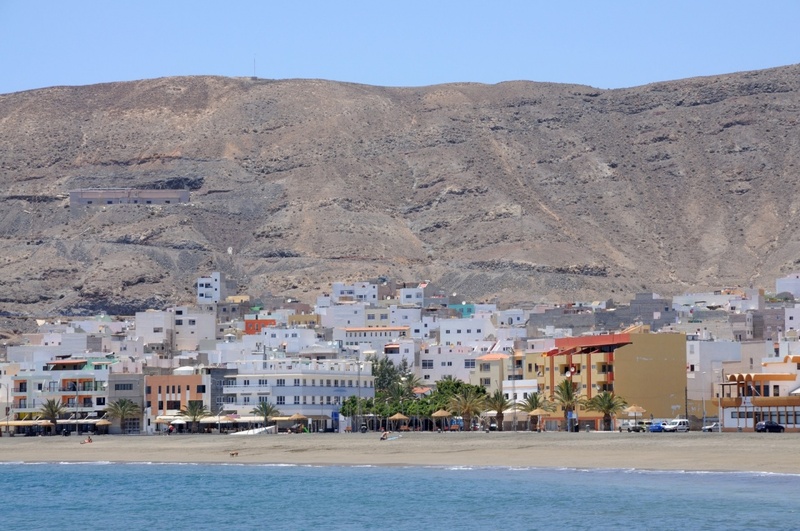 The new touristic zone of Caleta de Fuste beach is very popular and has a giant horse shoe shape. This town is built on a natural bay. The tide is quite apparent here and the water will rise and fall drastically in one day. A great place to look for shells and fish or crabs. This area is a protected habitat for fish and other marine animals so you will see fish right next to you as you swim. There is a semi-submersible boat that goes around the harbor and water craft and snorkeling can be found here. Reaching the south we can start finding the first black sanded beaches. Ajuy, a fishing village, is a good example. This place is famous for its ancient caves. It´s located at the mouth of the Barranco de Ajuy, where there is an important colony of palm trees. A quiet area ideal to get back to nature or to find several restaurants so sample fresh fish. Perhaps a romantic beach setting is what you and your partner need to keep the fire alive. Further south on the east side of the island are located the 'gift from god' beaches. These include many black sand beaches and many that extend for 20 km or more. Many of these beaches are shallow and you can walk out 50 meters or more and remain less than waist-deep. In the dark sand beaches is a little bit hotter to the feet if walking barefoot and one should be ready for a higher temperature when traversing these beaches. Some of these beaches include Las Playitas, Gran Tarajal and Taralejo. Sotavento is the biggest and one of the most beautiful beaches the island has to offer with its blue green waters and meandering sand bars and bright white beaches mixing with the warm waters. It's short drive from the main road but should definitely be checked out. They are the perfect destination for the experienced traveler and a great place for the kids to get red and peeling. Local bar/food spots are located around and you can order fish caught hours before right on that beach. Jandia and Morro Jable make up the south-east part of the island and have many different types of beaches from black sand to black pebble to small rock beaches. Many have fisherman areas where many boats come and go, and they are a great place to check out local customs and ways-of-life. The weather here is a little less predictable and you should be prepared for anything though it rarely gets out of control. You sometimes may need more than a bikini and shades, as it is around the southern end of the island and weather and waves bend around the end of the island here. The rip tide here should also be respected and observed. It is not too dangerous but sometimes can be unpredictable. Traveling around to the east side of the island and starting from the north end, you will find many beautiful and well visited beaches. These beaches are alive with travelers and many fisherman and sport travelers take advantage of these easy waters and the crystal-clear nature of the surf.